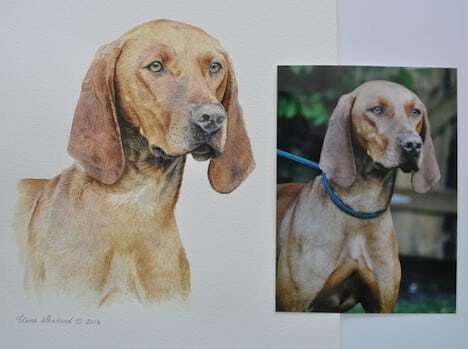 This page is all about commissioning a pet portrait. Claire has been painting people's pets for decades, with hundreds of delighted customers. For animal lovers, there's nothing quite like having your pet immortalised with their own watercolour pet portrait. Whether you're looking for a gift to surprise a loved one for a birthday, anniversary or Christmas, or just want to treat yourself, commissioning a pet portrait is something you can treasure forever. The pet portrait prices are set so that Claire can paint as many animals for people as possible, whilst reflecting the quality of Claire's work. If geographically possible, Claire likes to visit her subjects so that she has more than just a photograph to work from. This really allows her to get to know the animal, helping to capture their personality when painting the portrait. Where that's not possible because of the travel distance or the animal has sadly passed, Claire can work from detailed photographs taken by you to get the same result. View Claire's pet photography tips below to make sure that your photos will be good enough to work from. Claire predominantly only paints in watercolours because she believes it provides a very special and quality result. Some of the landscape work produced is done in another medium such as acrylics, so Claire does work with a range of different art materials. Claire gets booked up very quickly and as a result is typically very busy for most of the year. Therefore, it's best to allow as much time as possible when enquiring. This is even more so at Christmas time, so we recommend booking in your Christmas portrait gift at least 4-5 months in advance. A lot of portraits are supplied as gifts, but if it's too hard to arrange without the owner knowing, Claire will also supply Gift Vouchers* if you don’t want to organise the surprise. Please contact Claire today or telephone +(0)1453 887776. *Gift vouchers must be redeemed within 1 year of purchase. Claire's forte is her attention to detail within her portaits. She aims to capture the personality and spirit of each animal that she paints, and this is why her work proves so popular with her customers. This is why good quality photos are so critical. 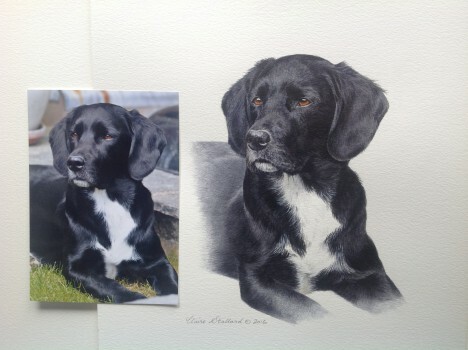 The pet portrait that Claire produces will depend on the quality of the photographs supplied. You do not need to hire a professional photographer but you will need to set aside a little time and lots of patience! A bright but overcast day is the best. Try to avoid bright sunlight and it is better not to use flash photography please. Engage their attention and take lots of shots from different angles. The head should fill the frame and be in sharp focus. That’s the beauty of being digital! Snap away until your heart's content and then choose the best ones later. You may want your pet to look very alert or relaxed and at ease. Please remember most importantly that the deciding shot is going to be almost identical and on your wall for many years. Claire will require a small deposit at the start of the commission as security. The balance is then due when the painting is complete, and payment can be made by cash, cheque or Internet Bank Transfer. View the prices of pet portraits here. You are under no obligation to purchase unless fully satisfied. So why not contact Claire today with your enquiry and she'll be delighted to assist you.